in eZ Platform Enterprise Edition you can use Fastly, which has native support as HTTP cache and CDN. Redis is the recommended cache solution for clustering. An alternative solution is using Memcached. 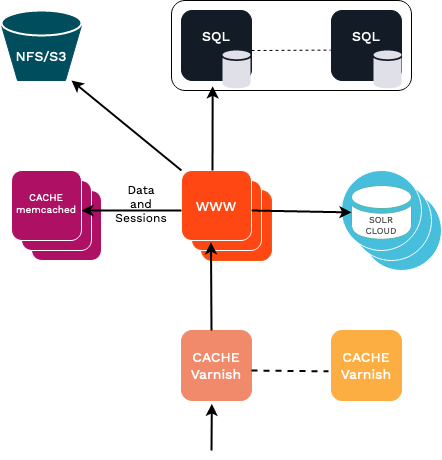 See persistence cache documentation on information on how to configure them. For a cluster setup you need to configure sessions to use a back end that is shared between web servers. The main options out of the box in Symfony are the native PHP Memcached or PHP Redis session handlers, alternatively there is Symfony session handler for PDO (database). Session locking is available with php-memcached, and with php-redis (v4.2.0 and higher). On eZ Platform Cloud (and Platform.sh) Redis is preferred and supported. eZ Platform supports multi-server setups by means of custom IO handlers. They make sure that files are correctly synchronized among the multiple clients using the data.